The Dodge Grand Caravan is the antithesis of a sports car, a wholly practical vehicle that has dutifully served as a family hauler for the past three decades. When the Plymouth Voyager and Dodge Caravan were introduced in 1983, a new vehicle segment, minivans, was introduced. The Grand Caravan, a stretched wheelbase version of the Caravan arrived a few years later and it, along with the Chrysler Town & Country, are what remain of Chrysler’s minivan offerings. 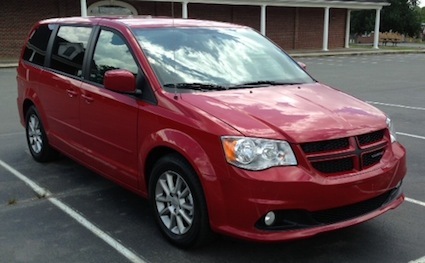 The tested model was a 2013 Dodge Grand Caravan R/T, a vehicle that arrived following my week with the BMW M6 Coupe. Where the BMW was all about unbridled speed and opulence on a sport frame, the Dodge Grand Caravan was two tons of slab styling, a veritable rolling embarrassment and an exercise in personal humility. Contrasts and humility aside, I did get used to the Dodge and it ended up being the family hauler of choice for my wife and our two sons. 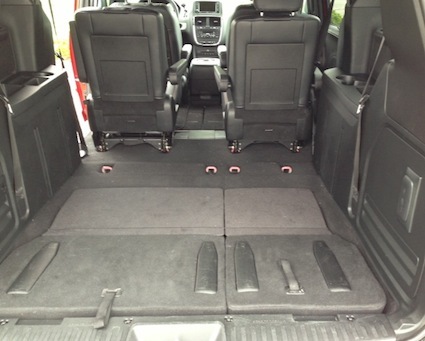 The Dodge Grand Caravan is available in five trim levels, with the R/T the most expensive of the lot. This model features a sport-tuned suspension, polished aluminum wheels and black leather seating surfaces. Supposedly, these changes make the Grand Caravan more appealing to dads you know, us guys who absolutely detest soccer mom vehicles. Well, as the saying goes: you cant put lipstick on a pig and make it look like something else. It is still a pig. But, Dodge has tried its very best with the R/T and just one week with its minivan showed this writer why these vehicles remain popular despite the wholesale shift to crossover SUVs. Indeed, Dodge has a pair of crossovers that siphon sales from the Grand Caravan: the Journey and the Durango. Neither model, however, can match the Grand Caravan in interior room and passenger utility: the Grand Caravans strength is with its interior room and how that room can be converted into a massive storage compartment on wheels thanks to its innovative stow n go seating arrangement. It is now called Super Stow ‘N Go as both second and third row seats fold effortlessly into the floor, creating a cavernous storage area suitable for bringing home those yard sale finds. No other manufacturer offers disappearing seats, what both the Dodge Grand Caravan and the Chrysler Town & Country are noted for. The Grand Caravan R/T features quad halogen headlamps that flank the Dodge crosshairs grille and are located directly above its fog lights. The vans body lines are as upright and nondescript as you can get, but both rear doors slide open and, along with the liftgate, are power operated. Access to the second and third rows is ridiculously easy with the second row captains chairs folding forward with just one touch of a button. The third row seat offers sufficient room for three, although you will soon notice that back support is wanting what was sacrificed to ensure that these seats can fold into the floor without excess padding getting in the way. For kids, the last seat works out just fine, for adults not so much. One thing that I have my oldest son do whenever a family vehicle arrives is to count the number of storage compartments. Those compartments are usually in abundance with family haulers and the Dodge Grand Caravan shines in this department. Or should I say, compartments. We counted 11 drink holders and also found storage compartments in the doors, the door sills, between the front seats, at the foot of the front seats at the bottom of the center stack, two glove boxes, and other nooks and crannies throughout. A mother must have designed the interior with both her children and her children’s friends in mind, leaving no chance that enough storage could be left out. And inside of those compartments were some surprises too: the upper glove box featured a USB port, the forward storage compartment included a pair of 12-volt outlets and the aft storage compartment had a removable tray. The Dodge Grand Caravan R/T also comes equipped with a 115-volt outlet; a third 12-volt outlet is found in the cargo area. That cargo area also houses the spare tire jack and winch on the left and a removable flashlight on the right. The spare tire itself is located underneath the Dodge and is released by rotating a nut located underneath the removable storage compartment up front. A YouTube video demonstrates how that is done. The Grand Caravan’s stow ‘n go seating. Every 2013 Dodge Grand Caravan is outfitted with a Pentastar 3.6-liter V-6 engine that is mated with a six-speed automatic transmission. That means that the base American Value Package model is priced from $19,995 and just may be the only V-6 model offered at such a low price point. Likely, you’ll choose one of the better trim packages especially if a navigation system, XM radio and a comfortable drivers seat are important to you. The Dodge Grand Caravan moves with ease and taps as much as 283 horsepower and 260 foot-pounds of torque as needed. For the most part the engine was responsive with only minor hesitation when stepping on the accelerator to pass at highway speeds. Its a normally aspirated engine for this front-wheel drive model; a turbocharged engine would have been overkill and likely would have made handling an oversteer nightmare. That said, the sport-tuned suspension system yields a vehicle that is easy to handle, one with a taut turning radius and is also a snap to park. Still, it isn’t a sports car and if you’re expecting a hot ride, you wont find it in the Dodge Grand Caravan. Instead, check out the Dodge Durango to fulfill your need for sportiness and speed. Dodge Grand Caravan R/T: The Man Van?! This Dodge has a dashboard-mounted transmission shifter. If you sense that you are driving a box on wheels with the Dodge Grand Caravan, then you have nailed it. Even so, this model offers a pleasant driver’s seat with controls placed where you would expect them. That anomaly aside, the instrument gauges are big and brightly lit, featuring both digital and analog displays. The UConnect touchscreen in the center stack provides ease of access to infotainment controls, what you can mange by touch or by voice. 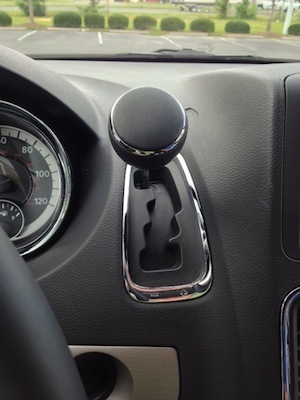 As a dad, there are some nifty features that the Dodge Grand Caravan offers besides what was mentioned earlier. The second and third row seats benefit from manual sun shades and the second row windows also power down. The overhead console, an entertainment delight, features a pair of 9-inch screens visible to second and third row passengers. Lastly, when equipped with a trailering package, this van pulls up to 3,600 pounds. Yes, if you can’t have a Ram 1500 or the Dodge Durango, you may be able to make something of this man van, a vehicle that still achieves high marks for many families. EPA: 17 mpg city, 25 mpg hwy.